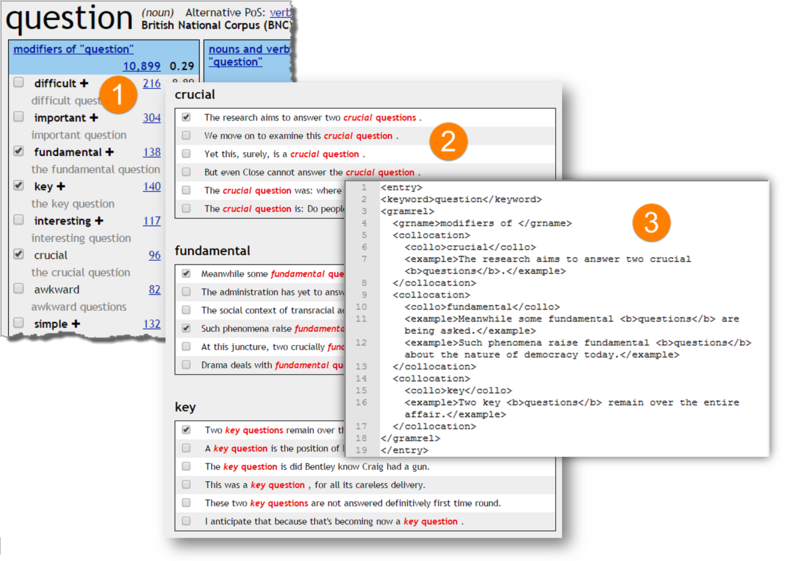 TickBox Lexicography (TBL) is a technology facilitating semi-automatic dictionary entry drafting and the collection of good dictionary examples with a click of the mouse. In its default configuration, it combines the benefits of Word Sketch and GDEX to easily generate dictionary entry drafts. TBL can also be used by authors of teaching materials looking for suitable sentences for language exercises. TBL reduces significantly the time needed to research and collect examples of use. the user uses the mouse to select the best examples and saves them together with the collocations into an xml file ready for import into a dictionary editing software. The xml file serves as a template for the future dictionary entry. The xml file is user customisable to ensure compatibility with any external software. The content and format of the dictionary entry draft generated by Sketch Engine can be customized with additional information such as grammatical labels, thesaurus and other data and information based on the customer requirements. Please contact us for more details. TBL is not available to users by default. It has to be activated and is subject to an annual fee. Please contact us for a quote. Lexical Computing is a provider of custom-made language data and lexical databases. Kilgarriff, Adam and Kovář, Vojtěch and Rychlý, Pavel (2010). Tickbox Lexicography. In eLexicography in the 21st century: New challenges, new applications, Presses universitaires de Louvain, Brussels, pp. 411–418.